Today I went for a well needed shopping spree in town and I picked up a few lovely pieces for the spring time! I thought that I'd share with you what I brought! Firstly I brought this gorgeous dress from H&M. 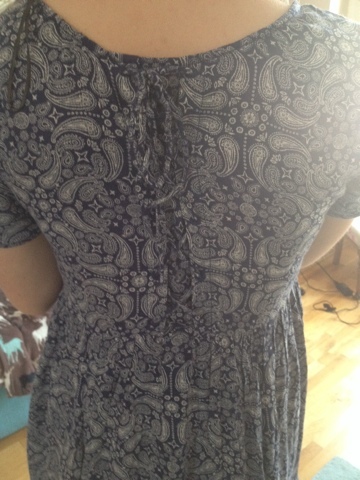 It's a blue and white paisley patterned baby doll dress made out of the softest material (viscose I think!). It hangs so nicely and I love the crisscross lace up on the back. Although it's a little bit on the short side, it will be great for summer as it's so light and floaty. It was £14.99 (but I had a 25% off coupon woop)! I also brought this top from H&M for £7.99. I've been looking for this corset cami type of top as I love the collection of Bethany Mota's at Aeropostalé but I really wanted a black one as they didn't have this colour. This one from H&M is so nice and flattering and a nice length too. I love wearing it with my M&S charity find skirt! There were other ones with patterns on in there which I think I may go back for! You're either going to love or loathe this one! It's a high neck floral long top/ short beach dress for £6 at Primark. I love the bright colours and high neck- I spotted some very similar in Next but for a lot more money!! I think that I will wear this one a lot for going to the beach this summer. 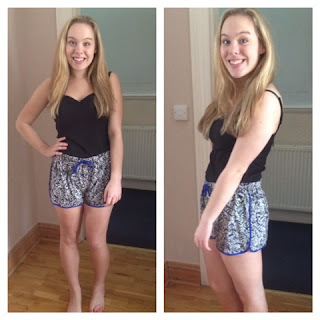 These cute black, white and electric blue shorts were only £4 from Primark! They're such good quality and very comfy. Can't wait to wear these when the sun makes an appearance! So a very successful day shopping for sure! Here's my #OOTD for going shopping today- my favourite Henry Holland dress with Topshop boots. I hope you enjoyed my post today guys! Have you been spring shopping yet? What have you brought?! I love being nosey and seeing people's purchases! Hi! Thanks for checking out my blog :) I'll definitely check out your post! Ooh I'm on the look out for some summer shoes! Me too, cannot wait for the summer now- our winter has gone on for too long!